Daily Inspiration - Daily Quotes: See no evil, Hear no evil, Speak no evil. see no evil . hear no evil . do no evil . speak no evil . but i will use my fist to correct the evil . 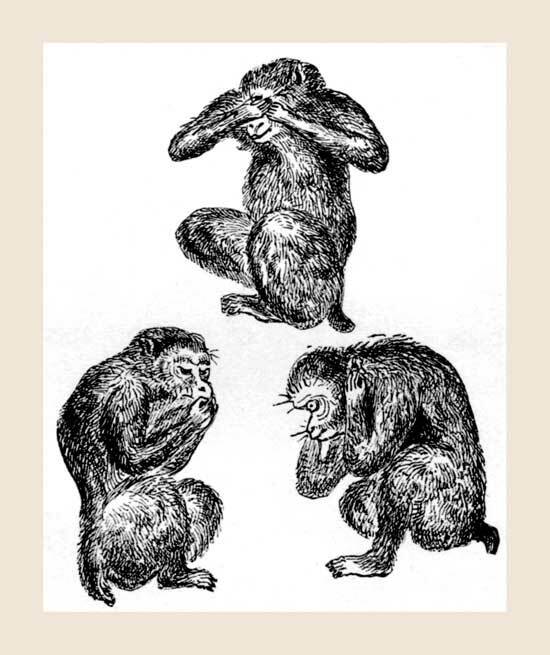 Unfortunately most people are so removed and in the "don't want to get involved" mode that this philosophy of "See,Speak,Hear no evil" could easily be misinterpreted. We live in a world now that requires involvement. If you see something, say something. We all need to take our blinders off. To Goheidigo: By all means, take action whenever you see someone being harmed by a third party. Report it when you see a crime. Express your outrage at the Israeli atrocities against the Palestinians - or the Saudi human rights abuses against their own people. However - and this is the point of my article - allow people to live as they choose to live. Allow them their religious preferences, diet preferences, career choices, lifestyle, attitudes, and habits. If your son-in law is happy as a carpenter, don't nag him that he should go to college. If a gay couple moves into your neighborhood, welcome them.